We appreciate all the help we had at Rest Stop 1 here. 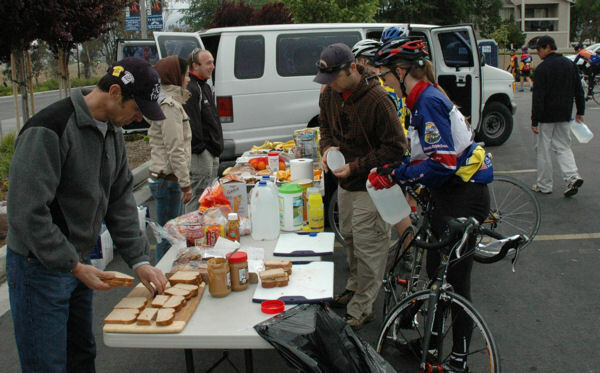 The riders arrived at this first Rest Stop in large groups so it took a lot of fast teamwork to make it all happen. The Rest Stop 1 Team consisted of Lauren Bendon, Sandy Bendon, Steve Brown, Robin Gardner, Deanna Hare, Ken Isaak, Patricia Leung, Jason Mumper, Julie Robertson, Tony Rodriguez, Mike Sullivan, Spike Summers, Saveria Tilden, and Ivan Tovar. Thanks to all!! The following folks helped with Roving SAG: Frank Neal and Mike Rathwell … both of whom worked the event start to finish helping so many riders work through all kinds of problems.